Added by Indo American News on January 22, 2016. Children: Thrayee Sai Saridey (9),Anand Morales (9), Apoorv Nednur (11),Sai Aakarsha Saridey(12), Shravya Aparasu (12), Saureesh Aparasu (12), Adults: Raghavender Nednur,Event Chair, Kranthi Nednur, Dr. Ponnada Narayana, Dr.Sai Kaumudi Saridey, Amanda Vavilala, Satish Saridey, Shankar Perumaalla, Rohan Perumaalla, Raghav Perumaalla, Lakshmi Vavilala,Parul Fernandes,Hiren Sarma, Atul kothari (Gandhi Library) and Krishna Vavilala, FIS Chair dressed as Gandhi ji. 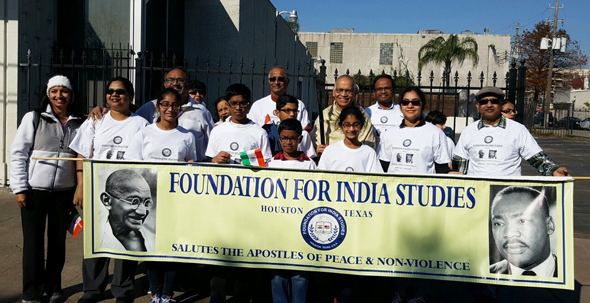 HOUSTON: Under fabulous sunny skies, a group of dedicated Indian adults and children maintained the tradition of participating in the annual MLK Jr. Grande Parade, for the fifth year in a row. Being the winner of the prestigious 2015 Grand Marshal Award, FIS was offered a premier spot in the Honors Section of the parade. The children thoroughly enjoyed the attention they got from the spectators and the fanfare. FIS was committed to connect Mahatma Gandhi’s legacy with MLK Jr. Though the two had never met, MLK Jr. was inspired by Gandhi ji’s philosophy of Peace and Non-violence in his fight against racial discrimination in America. On invitation from Gandhi Memorial Fund, King and his wife Coretta Scott visited India in Feb.1959. King declared that he may go to other countries as tourist, but to India he would go as a pilgrim. King also spoke on All India Radio broadcast when he said, “If this age is to survive, it must follow the way of love and nonviolence that [Gandhi] so nobly illustrated in his life.” Upon his return, he also wrote in Ebony magazine that his visit to India was a revelation as if “the spear of frustration had been transformed into a “shaft of Light”. In 2009, fifty years after his trip to India, US Congress unanimously passed a resolution introduced by Rep. John Lewis (D-GA) recognizing Gandhi’s influence on MLK Jr. Here in Houston, Congressman AL Green also declared during his speech at Hilcroft’s Mahatma Gandhi District inauguration that “there is no King without Gandhi.” Names of Gandhi and King are synonymous in the context of Peace and Non-Violence. Foundation for India Studies(FIS) is proud to participate every year in the MLK Parade.